Engineering - Click to read about how Safe-T-Covers aluminum equipment covers are designed and engineered to meet ASSE standard 1060 as well as the International Plumbing Code. You'll find information about colors, sizing, climate control, materials and more. 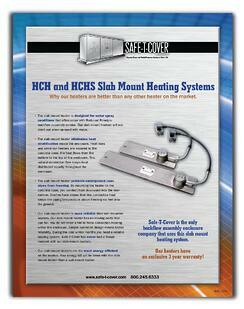 Heater - Click for an in depth look at our patented slab mounted heater. 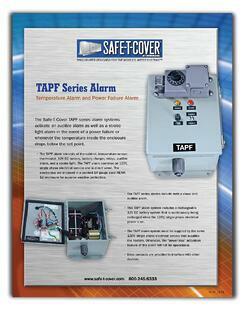 The only heater in the industry that heats equipment cover interior as well as the pipes underneath. Alarm - Our Temperature and Power Failure alarm system emits both a flashing light and sound to alert you quickly about any problems. Click to read about the specs. 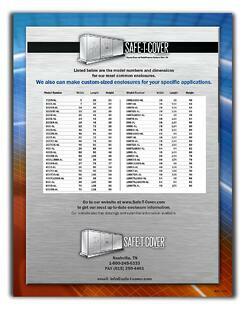 Supply House - As a supply house employee, you need information fast and at your fingertips. This informative brochure was designed with you in mind.